YouÃ�ï¿½Ã�Â¯Ã�ï¿½Ã�Â¿Ã�ï¿½Ã�Â½ve been asking us for sometime for a product that will color your etchings and not wash off. We finally found a product we like and highly recommend! ItÃ�ï¿½Ã�Â¯Ã�ï¿½Ã�Â¿Ã�ï¿½Ã�Â½s transparent and kinda permanent. (see washing instructions). 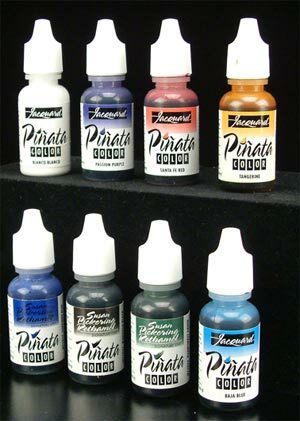 The Pinata tints give a nice soft watercolor effect to your etchings, without overwhelming or hiding them. Glass objects that have been decorated with these tints can be washed with water only (no soap, no glass cleaners) as these tints will not come off with water. To remove the Pinata tints from your glass or your brushes, use the specially formulated Cleanup solution #61-4504 sold separately. HELPFUL HINT: The white tint can be added to your etched designs to punch it up or enhance a weak etched design! Pinata colors are beautiful, highly saturated, aid free transparent colors. They are alcohol based, indelible and moisture resistant when dry. That means you can work freely on most any clean surface: Glass, wood, plastic, metal, metal foil, leather, paper, vinyl, etc. 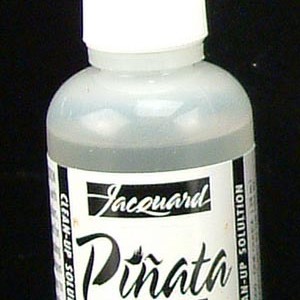 Highly versatile, Pinata color can be used in a variety of other applications: rubber stamping, fine art, scrap-booking, faux finishing techniques, airbrush application, staining wood & leather, as well as adding pizzazz to etched glass. 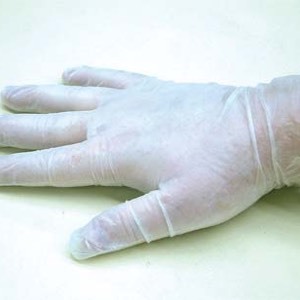 We strongly recommend that you use plastic gloves when handling these stains.